Did you know that law enforcement agencies lose out on hundreds of hireable potential police officers? After the initial application for law enforcement, many merely stop pursuing employment with an agency. For large cities, the applicant pool begins with 14,000 and ends at about 350. The candidate dropping epidemic occurs very often and quickly. Multiple factors contribute to candidates dropping off in the middle of the recruitment process. One component is the lack of communication, and the other is out-of-date recruitment practices. In a 2013 departmental survey, 11,000 applicants who did not finish the agency recruitment process responded it was due to excessive processing time, and lack of communication that led to their decision to withdraw. Every state and agency operate slightly different. It is essential to note that some of the qualifications may vary. Law enforcement agencies generally begin with a preliminary application. The application then follows with a series of tests including a written exam, a fitness test, and drug test. The next step requires a background investigation, psychological analysis, and polygraph to thoroughly examine all aspect of an individual’s makeup to be successful as a police officer. Time and effective communication are crucial for law enforcement agencies during each of these steps. It is essential to be thorough and quick especially for law enforcement officials when making hiring decisions. Applicants will usually decide on a different job opportunity or change their minds altogether when the process takes longer than foreseen. Candidates tend to feel a detachment when law enforcement agencies do not follow up or report thoroughly on next steps for their specific recruitment process. A significant lack of communication can make candidates think twice about the process they are embarking on becoming an officer. The process is usually tedious taking anywhere from 6-18 months. If your agency is losing potential officers, it may be wise to change some of your recruitment practices. The retention timeline takes on average 6 -18 months. It is vital to have consistent communication throughout this process explaining each step that will occur next. Streamlining information from the agency to applicants, provide them with current status information can improve retention as an applicant makes it through the hiring process. Agencies could begin attracting additional applicants from the onset by having open enrollment year round, not merely once or twice a year. By increasing open enrollment opportunities, applicants can consider the law enforcement recruitment process and fully commit when they are ready versus when the agency has permitted. 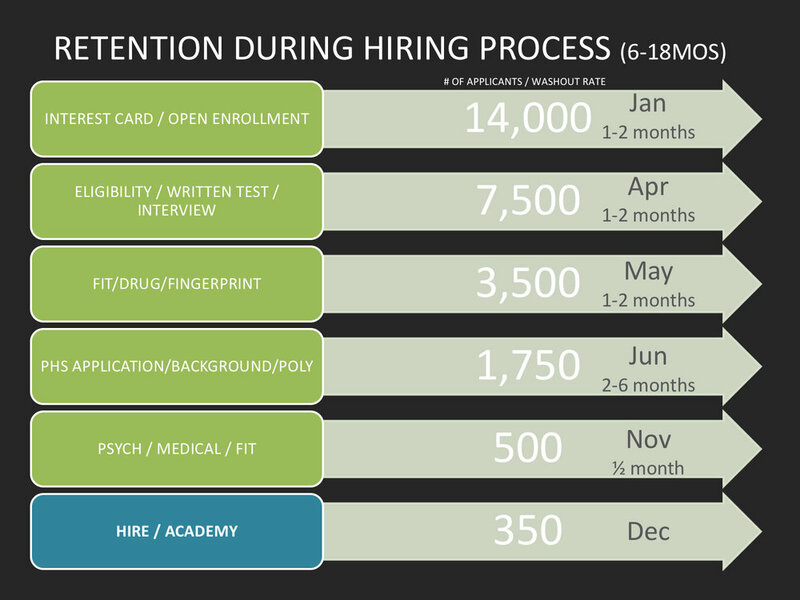 The longest step in the recruitment process is the PHS application/background investigation/polygraph. Most of the lack of information to the applicant occurs at this step causing candidates to drop off from the process. Lack of communication or miscommunication is sometimes due to agencies conducting their background investigation in-house. Large agencies are sometimes strapped in competing resources to fight crime, serve the community and process internal background checks on potential applicants. Unfortunately, with good reason, processing internal background checks for an agency becomes a lower priority when there is a crime to solve and a community to serve. An agency's competing priorities, unintentionally becomes a hold up in the applicant's recruitment process and the agency may see the most number of withdrawals from applicants during this stage if processing time is becoming lengthy and communication with the applicant is not transparent. When the process takes too long, it could cause a candidate who may be ideal for your agency to slip through the cracks. When there is very little communication between agencies and the applicants, a ripple effect happens where eventually the applicant drops the agency. A combination of both is even worse. Stopping the candidate drop epidemic begins with first instilling changes in protocol, effective communication, and sufficient time management in a hiring decision system. KENTECH partners with agencies to meet their hiring demands and ensuring the best candidates to join the force.